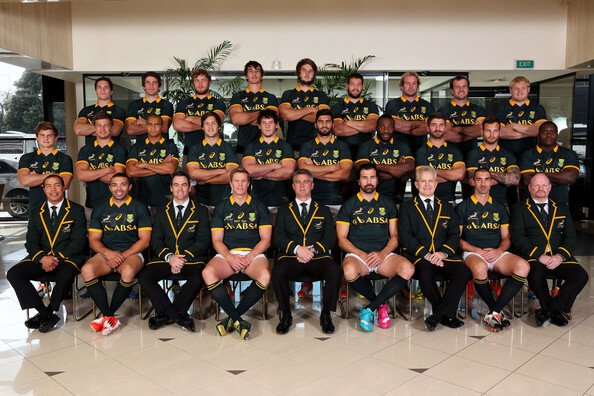 L to R, front row: Assistant coach Ricardo Loubscher, Bryan Habana, assistant coach Johann van Graan, Jean de Villiers, coach Heyneke Meyer, Victor Matfield, team manager Ian Schwartz, Ruan Pienaar, assistant coach John McFarland. Middle: Patrick Lambie, Handre Pollard, Cornal Hendricks, Jan Serfontein, Marcell Coetzee, Damian de Allende, Tendai Mtawarira, Willie le Roux, Francois Hougaard, Trevor Nyakane. Back: Francois Louw, Warren Whiteley, Duane Vermeulen, Eben Etzebeth, Lood de Jager, Marcel van der Merwe, Jannie du Plessis, Bismarck du Plessis, Adriaan Strauss during a South Africa Springboks Captain's Run on September 12, 2014 in Wellington, New Zealand.